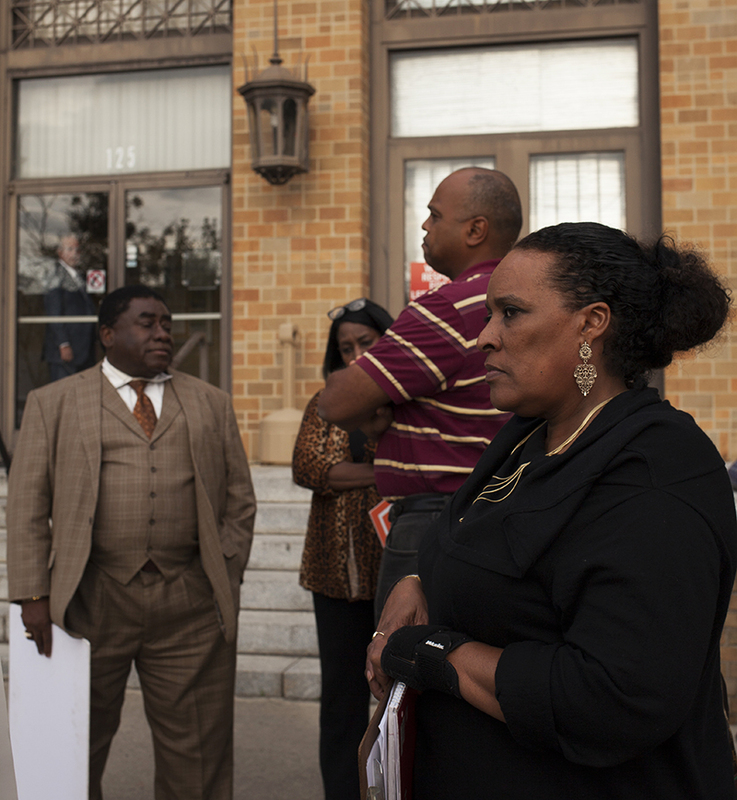 A s Richmond County Commissioner Kenneth Robinette walked to the administration building for his monthly meeting, he passed about a half-dozen demonstrators who had assembled near the steps outside. It was their only opportunity to be publicly heard by Robinette, because once inside, they would not be allowed to speak. Since 2008, the Richmond County Commissioners have restricted public comment during their monthly meetings, which is unconstitutional. 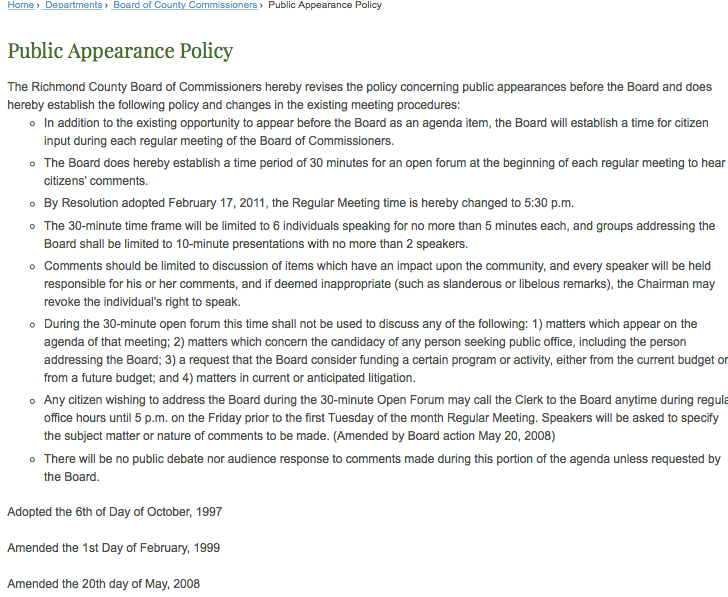 According to the county’s “public appearance policy,” each meeting provides a 30-minute “open forum.” But it isn’t really open: Citizens are forbidden from discussing any item that appears on that meeting’s agenda. Under North Carolina law, counties and cities are required allocated time in their meetings for public comment at least monthly. This time is known as a “limited public forum,” said Jones, who is a First Amendment scholar. And in limited public forums, officials can’t single out a category of class or speech to prohibit. “There’s almost no getting around that,” Jones added. Government officials can require people to speak from a podium and they can place time limits on the comments. “But they can’t really regulate the content,” Jones said. That includes comments “deemed inappropriate,” even if they are slanderous or libelous. While those comments could be the subject of a separate defamation suit, it is not the commission’s prerogative to legally enforce restrictions on that speech. A few courts have ruled that within these “limited public forums,” a government body can narrow the scope of comments to topics that are germane to that unit of government. For example, city councils have no control over school funding; that falls to the county and the state. T hat situation doesn’t apply to the petition by Concerned Citizens of Richmond County. They attended the March 7 meeting to ask the seven-member county commission to place a moratorium on the construction of a industrial wood pellet plant in nearby Hamlet. Proposed by Enviva, the plant essentially grinds hardwood trees, such as bald cypress, willow oak and sweet gum, plus varieties of pine, into small pellets. Those pellets are then shipped from the Port of Wilmington, across the Atlantic and on to the United Kingdom to be burned as fuel for electric power plants. But since Item No. 17 on the agenda was an update from an Enviva spokesman, the Concerned Citizens of Richmond County could not petition their elected officials at that meeting. The concerned citizens had tried to speak at the February meeting, when Enviva was not on the agenda. However, Adam Macon of the Dogwood Alliance, which also opposes the pellet plant, said they weren’t allowed to speak because they didn’t sign up on the previous Friday. Citizens must state the topic of their comments at that time. Ussery was on the commission when it amended public appearance policy. He said the commission confers with the county attorney on laws, ordinances and general policy changes. NCPW called County Attorney Stephan Futrell, who is also in private practice. The administrative assistant who answered the phone took a message, but when asked to provide Futrell’s email, she replied, “We don’t give that out.” Futrell had not returned the call by press time. Richmond County’s public appearance policy restricts comments to “items which have an impact on the community.” There is no question that the Enviva plant would have such an impact. Richmond County has courted the Maryland-based company by offering $1.6 million in state tax incentives and yearly tax breaks based on the number of jobs it creates — all public money. Enviva has said it will create 80 jobs in the community, with an average annual wage of $37,961. As important are the many environmental and social justices issues associated with these operations: the destruction of the forests, plus noise, odor, traffic from log trucks and air pollution in the form of fine particulate matter. The pellets’ end use as fuel also emits as much carbon dioxide per unit as burning coal. The plant would be built near the CSX rail yard, within a mile of Dobbins Heights, a small, low-income, African-American neighborhood near Hamlet. This would be Enviva’s fourth plant in North Carolina; the others are in Ahoskie in Hertford County; near Garysburg in Northampton County and near Faison and Clinton in Sampson County. The Richmond County public appearance policy. The screenshot was taken on March 13, 2017.